Gonets- satellite were the civilian derivate of the military Strela-3 satellite system. The Gonets system was offered to support international health organizations to meet their global communications needs for the transfer of medical data and records to remote sites. After two prototype Gonets satellites with Kosmos designation operated in the Gonets-D constellation, the operational Gonets was to be deployed in the Gonets-D1 constellation of 12 satellites consisting of 6 satellites in 2 orbital planes between 1996 and 1998. Each satellite had a single simultaneous earth-space and space-earth channel. On-board storage was 12 Mbits of data, with a transmission rate of 2.4 kbit/sec. Attitude control was achieved through gravity-gradient stabilization. The electrical power system, provided by solar cells and nickel-hydrogen batteries, provided an average 40 W for the payload which was designed to operate for five years. A partial D-1 constellation was completed and operated beyond the projected dates of termination. The satellites were launched on Tsiklon-3 boosters, sharing the launch with Strela-3 satellites. 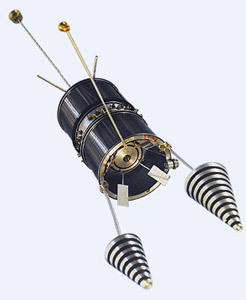 In the commercial variant, the satellites, known as Gonets (Messenger), were capable of store-dump communications on 2-3 channels in the 2004-400 MHz band with a transmitter output power of 10 W. Data transmission rates available include 2.4 kbits/s, 9.6 kbit/s, and 64 kbit/s with an onboard storage capacity of 8 Mbytes. A handheld user terminal (UT-P) resembles a cellular phone and weighs only 1-3 kg. Finally the 250 kg Gonets were to be deployed at 1,350 km at 82.5 degrees, similar to the Strela-3 satellites, but distributed among six orbital planes for a total constellation of 36 spacecraft. This infrastructure would ensure a mean communication waiting time of less than 20 minutes with more than 80% probability.